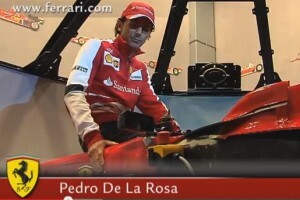 A rare look behind the scenes at the 2010 Ferrari Motorhome that travels to the European rounds of F1 these days. Describing it as a motorhome really does it no justice, it’s more like a portable multi storey palace. Watch as Fernando Alonso himself takes us on a tour lasting over 6 minutes, moving form room to room explaining what the function of each on is. Unfortunately it is not in English, but will well worth a look as you can figure out most of what the rooms are for. Watch as Fernando moves from the reception area, through to the cafe, peeks into the marketing offices, shows the various meeting rooms and engineers offices, a full kitchen where he runs into Massa, the drivers storage area, sponsor lounge/dining area, his own office/private area, Massas office/private area, team managers office, then finally up yet another level to more lounge areas complete with a fooseball tables. He ends outside on the balcony giving panaramic views out across the rest of the Formula One Paddock. 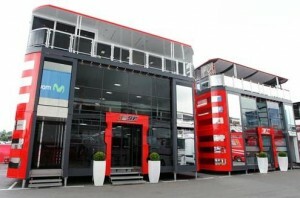 Truly an impressive home away form home with no expense or comfort spared. Even the decor is amazing with huge tv screens all around , and amazing Ferrari graphics and pictures all over the place.